(Host) A group of companies in Hardwick wants to change the way Americans eat. The companies are part of a nonprofit organization that they say can show communities how to raise and produce all the food they need. As VPR’s Amy Noyes reports, the University of Vermont will help to develop the model. (Noyes) There’s a simple premise behind the Center for an Agricultural Economy. It’s that a community can and should be able to feed itself. Tom Stearns is the founder of High Mowing Seeds, and he’s president of the Center’s board of directors. Stearns says the center will encourage farmers to work with local agricultural companies. Those companies use the raw commodities from farms to make a more valuable product. He says that boosts the bottom line for the company – and for the farmer. (Stearns) People are realizing all over the country that this food system of ours is broken and it’s led to all kinds of problems. You’ve got the healthcare crisis – a lot of which has to do with diet. You’ve got contaminated food, that generally is contaminated because it’s grown on huge mega-farms, or huge packing warehouses and shipped thousands of miles. That has returned people to think about local food in a whole new way. (Noyes) It’s a lot like the way dairy farmers once worked with a local creamery. They had a market for their milk. And the creamery supplied the community with milk, cheese and cream. Stearns says local production is a way for farmers and consumers to save money in an era of rising energy prices. Such global trends have helped focus attention on The Center’s local food mission. The University of Vermont has endorsed the idea. Recently, UVM President Dan Fogel spent a day in Hardwick touring its agriculture businesses, including Vermont Natural Coatings. That’s a company that makes wood finishes from whey, a byproduct of dairy processing. 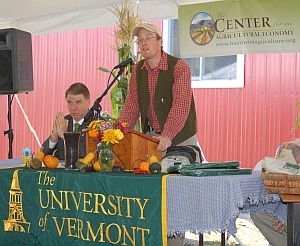 Fogel says the Center’s goals tie into UVM’s mission. (Fogel) It strikes me that this a beautiful example of how value-added agricultural projects are part of building the green economy in Vermont, and so those things come together. It’s partly about the food systems, it’s partly about value-added agricultural products that keep agriculture in Vermont viable. And it’s about the green economy. (Noyes) While in Hardwick, President Fogel and Tom Stearns signed a Memorandum of Understanding, that commits UVM’s resources to the center’s work. Formal arrangements have yet to be defined. Stearns says the resources will include laboratory facilities and faculty expertise. When UVM asked how it could assist The Center, Stearns said they asked for total access. (Stearns) As opposed to just having the college of ag be who we worked with, we said, "No, no, no, we want the college of medicine. We want engineering and mathematical sciences. We want ‘em all." And they all have something to contribute to this. (Noyes) Stearns says he’s excited about the prospects for the center – and about the interest it’s already generated. (Noyes) For VPR News, I’m Amy Noyes. introduces UVM President Dan Fogel. The University of Vermont Board of Trustees says employee morale suffered because of a relationship between the former president’s wife and a senior UVM official. Trustees found no laws or university policies were violated by the association between Rachel Kahn Fogel and Michael Schultz, an associate vice president for development.